While Ephraim was taking a nap one day, we let Nolan help us with a paintbrush. We're enjoying a fresher, cleaner porch! 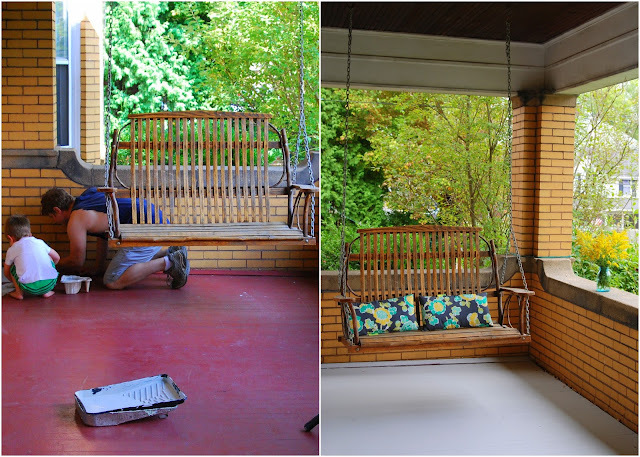 We currently don't have the budget for more porch furniture, but wouldn't it be gorgeous with a little extra seating?! Home-design-loving friends, do you have any other ideas for how we could better enjoy this space? Wow! It's so crazy what a little paint will do! We are thinking about painting our garage floor just to clean things up so it's good to see it was a success for y'all! So pretty!! Maybe your could tack bistro lights or white twinkly lights to the ceiling of the porch. It could add a little warm ambiance and looks good all year. Another idea is to drag your kitchen table out there on occasion for outside dinner or spread a blanket down for a picnic. I love the idea of bistro lights, and picnicking out there! I love the lighter and brighter look! Isn't it amazing what paint can do for a space?! Love the color! Really brightens the porch up! Check Bed, Bath & Beyond for patio furniture. We got our Acacia wood chairs (2 of them), a love seat, and a coffee table for a total of $250.00. I think the porch looks excellent! That sounds like a great deal! Thanks Reba! That looks great! How many coats did it take to cover the red? As far as tips, have you thought about some trim at the base of the wall to smooth the transition between the colors and textures? Fortunately, it only took two coats! I would add a nice area rug, too! I found one on clearance at Home Depot for $16! !